Many spring sports teams at Capital University have been waiting all year to finally begin competition, but the golf team is simply resuming their season, which they began in the fall. Both the men’s and women’s teams are lead by head coach Andy Garcia, who has been part of the Capital golf program in some form for nearly a decade. Garcia played at Capital as a student athlete and immediately came back to coach. Coach Garcia speaks highly of both teams and sees a promising future for both. Judging by significant improvement in the recent past, he believes that the golf program as a whole is headed for great things within the Ohio Athletic Conference (OAC) and beyond. Garcia was especially proud of the men’s team’s defeat of Otterbein University during last season. “Last year we beat Otterbein for the first time since I’ve been here as a student-athlete,” Garcia said. He added that Otterbein has been a national power throughout Division III and have come within mere strokes of winning the national title. Garcia considers this victory a testament to his senior class, the trio of Phillip Martin, Mitchell Cook, and Jeff Czerniakowski. Garcia cites Cook’s performance so far this year as a pleasant surprise and said that Cook is a “huge, huge asset” in terms of scoring and depth of the team. Coach Garcia is aware of the competition the OAC holds and knows what his golfers are up against as they enter the second half of the season. For the women, Garcia says that the University of Mount Union’s team is the team to beat. On the men’s side, Garcia cited Otterbein University as the toughest competition. in Lake Orion, Michigan, on Oct. 4, 2016. The highest mark for the women was a second-place finish at the same tournament. Regular season tournaments for both teams begin on March 25 for the women and April 1 for the men. With the the strong depth of both teams, Coach Garcia recognizes that recruiting is key and intends to keep bringing top-tier student athletes to Capital. 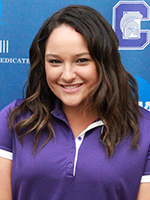 Both golf teams at Capital University are already doing great things, and Coach Garcia is sure that there are more to come.